ORANGE — Donald “Spin” Ainsworth of Orange, MA passed away on June 5, 2018. His life was dedicated to his passions for family, music, railroading, good food and his huge community of friends. Don was born on July 26, 1926 to George and Irene (Hause) Ainsworth of Athol. His father gave him the nickname Spin because after work, George would be greeted by little Don asking “Can we go for a spin?” Spin’s father owned the first automobile in Athol. Irene’s sister Rosella began teaching the piano to Spin when he was very young, inspiring a lifelong commitment to making music. In high school Spin put together his first band, The Golden Rhythms. They debuted at the Royalston Town Hall providing music for the annual harvest supper. After graduating from high school in 1944, Spin enlisted in the Navy. He received his basic training in Sampson, NY. After a short leave, he was sent to Mercer Field in NJ where he wrote to his mother, “Our chow is very good”. His unit at Mercer Field was eventually moved to Miami Florida and from there to Key West. In July of 1946 he was sent to Boston where he received his discharge papers. After returning home from his naval duties, Spin settled in Athol and went on to play in many bands over the years, including Rhythm Kings, The Signatures, Sounds of Music, and Marty’s Reminisce in which he played until 2017. Many of us remember him seated at the piano for countless shows and special events. In 1949 Spin married the late Beatrice (Blackmer) Ainsworth with whom he had 2 daughters; Marian Lans of East Falmouth, MA (Donald Lans Sr.) and Donna Ainsworth of Amherst, MA (Rajnar Vajra). He trained with and was assistant to the late Errol Crowl of Athol, piano technician and fellow Signatures band member. His long career with music and instruments included tuning and restoring pianos as well as teaching organ and piano. 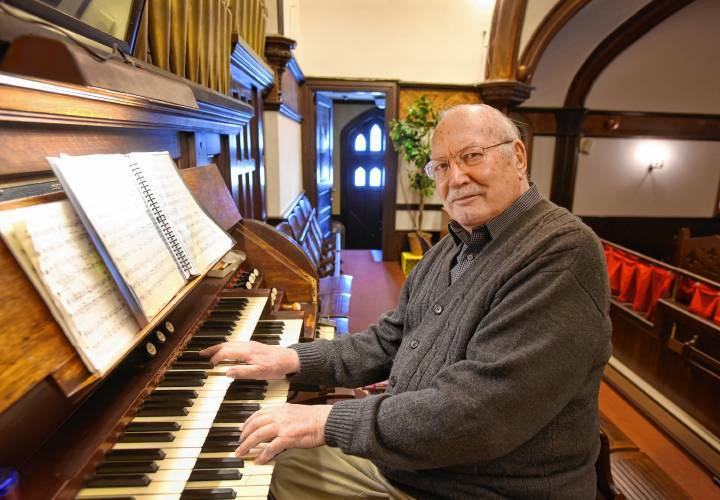 A longtime lodge member, Spin was organist for the Athol Masons for over 30 years. Over the decades Spin also played for morning services as organist at several area churches, finishing this career at Starrett Memorial Methodist Church in Athol. To the delight of his 2 young daughters, his membership as horn player in the Athol-Orange Minute Tapioca Band during the 1950’s and 60’s earned him a family membership to “The Ranch” in Orange. The family spent many happy summers there. Spin was a world traveler but particularly loved seeing the U.S. and Canada by rail. He was a long time member of the Mystic Valley Railroad Association. During his lifetime he traveled every Amtrak line in the U.S. at least once. Spin felt great pride and happiness in his grandchildren and great grandchildren. In lieu of flowers, his daughters are honoring his request that donations be made to a scholarship fund for his great-granddaughter, Alexis, who plans to go into law enforcement. Donations may be made to the Alexis Mainville-Schaefer Scholarship Fund and sent to Greenfield Cooperative Bank, 390 College Street, Amherst, MA 01002. Calling hours will be on June 23 from 2-4 and 7-9 at the Starrett Memorial United Methodist Church, 40 Island Street, Athol. A memorial service and musical celebration of Spin’s life will be held on June 24th beginning at 2:00 at the Starrett Memorial United Methodist Church.